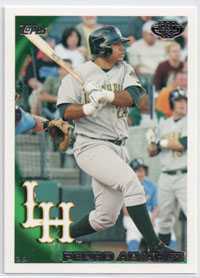 The Bottom Line: Topps Pro Debut is a bit of a mixed bag, the price is good and it has guys like Jason Heyward, Desmond Jennings, Aaron Hicks, Jesus Montero, Pedro Alvarez and other top tier rookies and prospects in it, but I'm not quite sure how Pro Debut fits into the big picture. 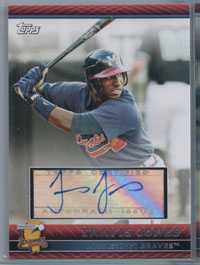 In the past, minor league products have struggled to find a niche due to products like Bowman Chrome Prospects and Topps Rookie Redemptions. 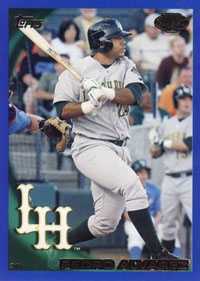 The low print run on Future's Game Jersey Cards, Blue and Gold cards could lead to suprising value down the road. If you're a fan of prospects, the box price is cheap enough and the prospects are good enough for you to get something out of it. If you're not a minor league baseball junky, this product is definitely not for you. The design was really disappointing. 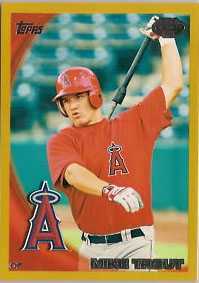 I'm not a fan of using the regular Topps Series 1 template for minor league cards, I would have liked to see them establish a unique look for Pro Debut. The autograph cards are ugly, they feel eerily similar to the dreaded "Career Best" autographs from other Topps products. The best looking cards in the product are hands down the Future's Game jersey cards, they are sharp looking and feature a large jersey swatch. I got one that actually showed evidence of use, it had a slight tear in it! Based on the low print run of the product, I think there is some definite value. 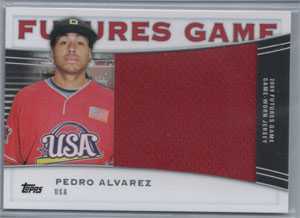 I think the future's Game Jersey cards are a major sleeper. I can't remember opening a product and being more excited about the Jersey Cards than the Auto's. 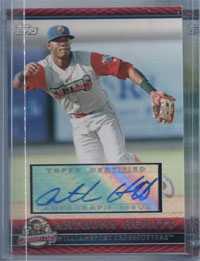 Really, the only auto in the entire set that feels valuable is the Aaron Hicks AFLAC cut signature auto. The fact that the Gold cards are numbered to 50 and the Blue cards are numbered to 259 should lead to some great value down the road. Jason Heyward, Carlos Santana, Aaron Hicks, Mike Trout, Pedro Alvarez, Brett Wallace, Tim Beckham, Justin Smoak, Yonder Alonso, Wil Myers, Ryan Westmoreland, there's too many great prospects to name! Even though Jason Heyward isn't in the base set, they found a way to incorporate him into the product with a Future's Game Jersey Card. 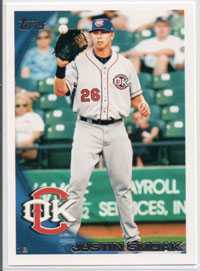 The only player missing from the Pro Debut party is Mike Stanton. The checklist is a prospector's dream! 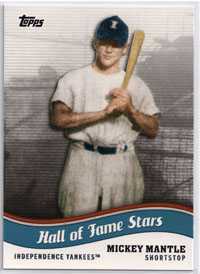 The one thing that is really starting to bother me with Topps is the overprinting of Mickey Mantle. Mantle is awesome, I get it, I have a great deal of respect for both him and the Yankees, but it should be exciting to get a Mantle, in Pro Debut, he's in some crappy insert. Topps has really gotta start making less Mantle's so that it means something to get one. Overprinting greatness is a disservice to everyone. As a prospect junky, I thoroughly enjoyed opening this product. 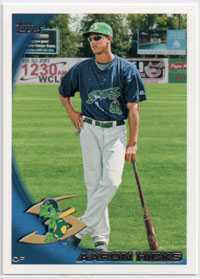 It had some of my favorite big name prospects like Aaron Hicks and Jason Heyward as well as some of my favorite lesser known prospects like Wil Myers. Again, if you aren't a minor league prospect fan, you probably won't enjoy this product very much. 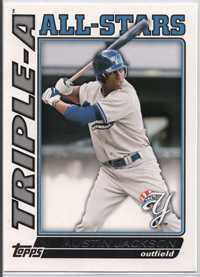 I would give this product a 3/5 because there are some hits involved, but these cards aren’t true rookie cards. I’m not sure whether their value will hold. This is a nice prospects based series. I got some jersey cards and blue parallels out of my box. As stated it has a solid checklist of top prospects. There was a low print run on several cards which I believe will retain their value so there is a chance to yield a good return on your investment. 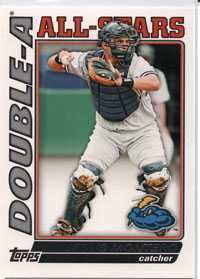 If 2010 Bowman is too pricey for you try this instead. 4 out of 5.